In 1978 Venancio Alvarez moved with his wife and two children from Houston to San Juan, Texas to work in the local oil industry. Shortly after arriving they welcomed a third child in 1979, a daughter whom they named Imelda. Imelda grew up as the "middle child", the third of five children to bless the Alvarez home. Imelda likes to say that she is "The cream of the cookie". In 1990 Venancio moved his family to a five acre tract of land he had purchased in Alamo, Texas. Here, he and his wife brought their children up, teaching them the value of working hard to get what they wanted from life. Middle child Imelda understood these values. She worked hard at her studies while attending PSJA schools. She graduated as a Junior Candidate in 1997 and, soon afterwards, enrolled in South Texas Vo-Tech's Licensed Vocational Nurse, LVN, program. In 1998 Imelda married Aldo Gonzalez, whom she had known while attending PSJA High School. As Imelda was the first of her siblings to marry, their families held a large wedding ceremony for them at what was then the Pharr Community Center in Pharr, Texas. Soon, Aldo and Imelda were blessed by the birth of Ronaldo, the first of three sons. While working for a local gym in 2001, selling memberships on a commission basis, Imelda realized that she had a knack for sales. Her success at earning good commissions, along with her natural talent for interacting with people, led her to pursue this line of work. A fellow employee, Nancy Garza, introduced Imelda to insurance sales for a supplemental only insurance company. Imelda studied diligently and soon she was awarded her license to sell Life and Health Insurance. She worked for this insurance company for several years travelling across South Texas from El Paso to Brownsville. Soon after the birth of their second child, Orlando, Imelda again put her hard study ethics to work and gained her Property and Casualty, P & C, license. She went to work for another insurance company in 2008. Following the birth of Brandon Lee, their third son, Imelda went back to work with the insurance company she had been with before, with the ever present thought that she would one day open her own agency here in the Valley. It was at a job fair that she met a recruiter from Farmer's Insurance. After visiting with the recruiter, she became convinced that this was the opportunity she had been looking for. 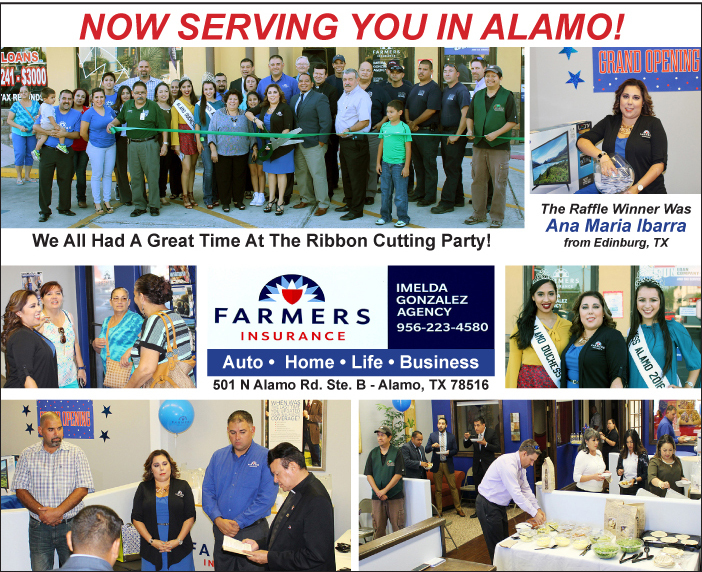 After eight months of training with Farmers Insurance, Imelda Gonzalez held the Grand Opening of her Farmers Insurance Agency office on August 1, 2016 at 501 N Alamo Rd. Suite B in Alamo, Texas. 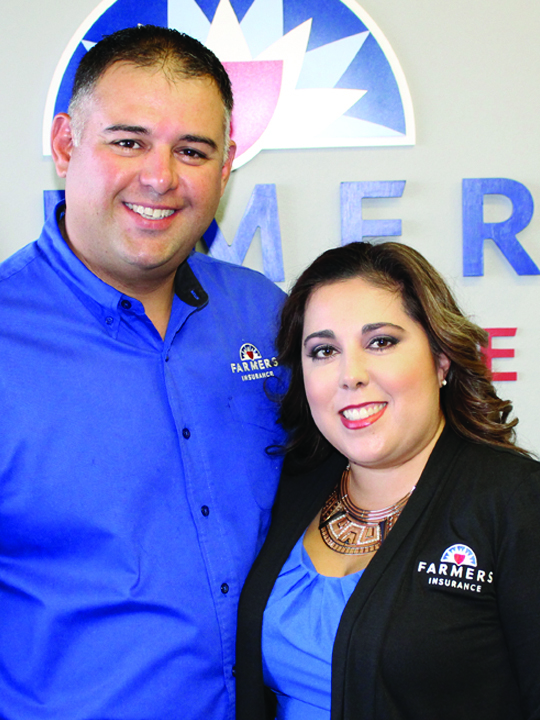 As your local Farmers agent in Alamo, TX, I help customers identify the insurance coverage that best fits your needs. This process is straightforward and personalized to help make you smarter about insurance. My staff and I have the knowledge and experience to help you better understand your coverage options whether that's auto, home, life, business insurance and more.